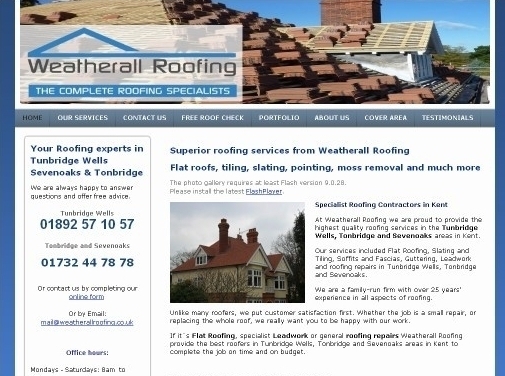 At Weatherall Roofing we are proud to provide the highest quality roofing services in the Tunbridge Wells, Tonbridge and Sevenoaks areas in Kent. Our services included Flat Roofing, Slating and Tiling, Soffits and Fascias, Guttering, Leadwork and roofing repairs in Tunbridge Wells, Tonbridge and Sevenoaks. We are a family-run firm with over 25 years' experience in all aspects of roofing. UK (Tunbridge Wells, Kent) based company - with over 25 years' experience - providing roofing services. Website includes details of services provided, associations and accreditations, photo gallery portfolio of previous work, "meet the team" page, testimonials, full company contact details.